The Gala Theatre's monthly lunchtime jazz concert series is a remarkable success story. Invariably there is a capacity audience - concerts often sell out weeks in advance* - and February's offering wasn't about to buck the trend. The first appreciable snowfall of winter failed to deter the Durham faithful and at the appointed start time of one o'clock, the second-floor studio space was full to overflowing. The Paul Edis Trio is a major draw anywhere, anytime and when the 'Brief History of Jazz Piano' forms the setlist it's a must-get-to occasion. Pianist Edis devised his potted history of the instrument and its famed practitioners a couple of years ago and the relatively few performances since have been nothing short of triumphant. Whiskers opened the programme; a fabulous tune, stellar playing. A first scribbled note read: They're swinging the arse off it. At its conclusion, Edis, the composer, said something along the lines of: We couldn't swing it any harder, perhaps we should go home now! Yes, it was that good. Whichever superstars are swinging it tonight in NYC they'll struggle to match it. Harold Arlen's It's Only a Paper Moon Nat King Cole-style with, perhaps, a touch of Erroll Garner, followed by Moten Swing (a la Oscar Peterson) just about reached the dizzying heights of the opener. Bill Evans' Very Early and a magical Lullaby of Birdland transported the listener back to 52nd Street's heyday. Edis' bandmates - bassist Andy Champion and drummer Russ Morgan - are two of the best around and as a trio, these guys would surely cut it on today's ultra-competitive New York scene. Edis did disappoint on one number. In introducing Ba-lue Bolivar Ba-lues-Are our pianist said he wouldn't be demonstrating Thelonious Monk's well-documented dance moves. Maybe next time, Dr Edis?! Conscious of the fast approaching two o'clock finish, Edis asked if we would stay on a few minutes past the top of the hour as he wanted to fit in two more tunes. We weren't going anywhere! Lush Life as transcribed and performed by Phineas Newborn Jr took us up to two, and, the other side of the hour, the Paul Edis Trio went out on Brubeck's Unsquare Dance. Gig of the month (so far)! * Emma Fisk's Hot Club du Nord will be at the Gala Theatre on April 5th but, if you haven't got a ticket, you're too late, it's a sellout three months in advance! 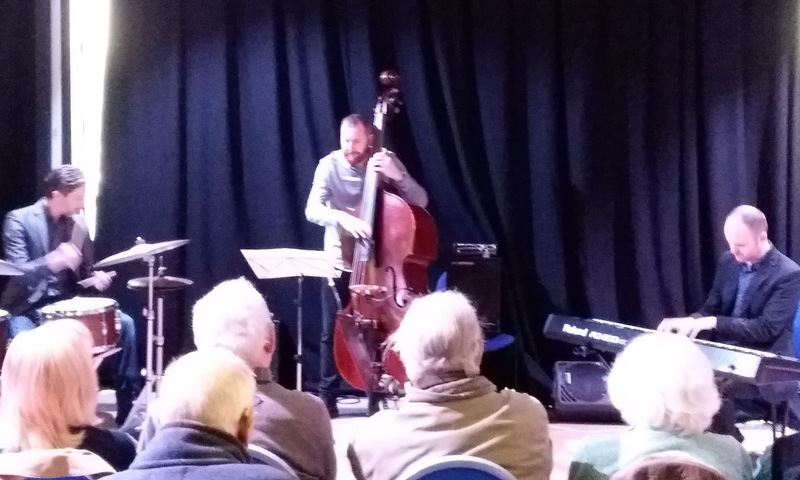 So, if you would like to attend next month's concert (March 1) featuring the Giles Strong Trio (Roly Veitch, Ian Paterson) book now or miss out. Tel: 03000 266 600. Wow sounds good - a bit like the Complete Works of William Shakespeare in 90 minutes! Well, perhaps not quite! Maybe there will be a less concise performance sometime in the future without a constricting timescale then we could have the good doctor's take on Jelly Roll, Fats, Art, Earl, Teddy, Bud, Chick, Herbie, Keith etc. Just a thought... Are you listening JNE, Globe, Black Swan?